Did you know there was such a thing as organic herbal blue tea? 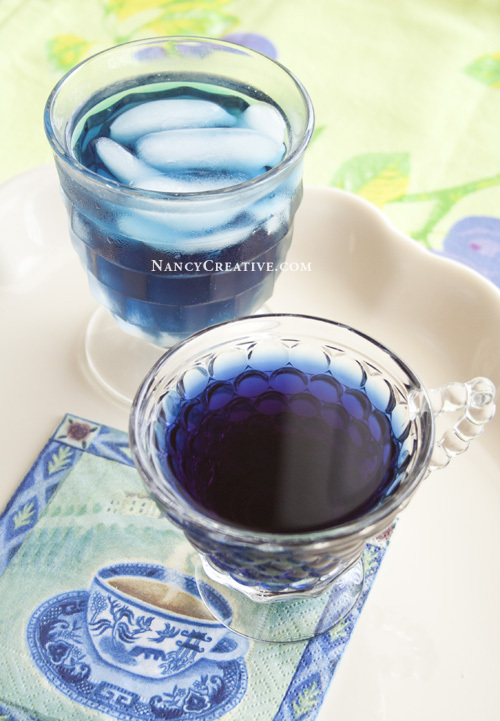 Well there is…BlueChai blue tea is made from organic butterfly pea flowers. I discovered this tea recently when I received a complimentary sample to try. 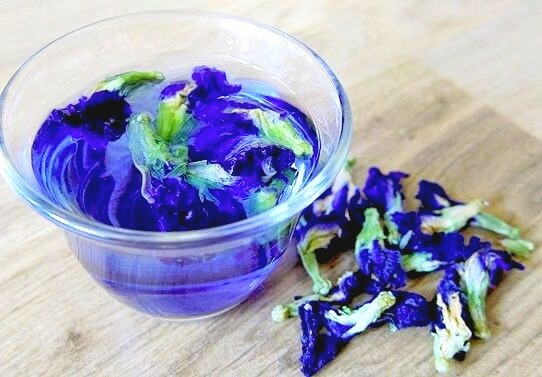 You can drink this tea hot or iced, and the tea, which has a blue color, can also be used as a natural food coloring. The aroma and taste of the tea is similar to green tea, but it is a caffeine-free herbal tisane. And if you like adding lemon or lime juice to your tea, you’ll get more of a violet shade. There are health benefits this tea offers that you can read about here, and when I made my tea I followed the brewing instructions at BlueChai.com. Put 1 teaspoon loose tea in a tea strainer or small cone coffee filter, then place in your cup. Add 1 cup, or 250 ml, hot water to the cup (if using a small cone coffee filter, pour water into the filter over the loose tea and let the tea steep in the filter). Steep tea 4-8 minutes, depending on the intensity and flavor desired, then drink either hot, or let cool and add ice cubes (the BlueChai website also mentions you can use the tea for 2 brews). If you want a very light brew, just steep for 2 minutes. Add honey and lemon if desired–adding lemon juice changes the color of the tea from blue to violet. I just steeped my tea for 2 minutes because I don’t like my tea very strong. I tried the tea both hot and iced. I really like this tea iced for the summer! I often put lemon slices in my tea but I was fresh out of lemon when I made this. But it is refreshing if you are a tea drinker like me and since I love the color blue, I enjoyed trying this out! If you’re interested in ordering, it’s only available through the BlueChai.com website and you’ll find ordering information there. 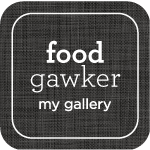 This entry was posted in Beverages/Smoothies, Food and Recipes, Healthy Eating and tagged antioxidants, blue tea, BlueChai Tea, featured, healthy, herbal on May 24, 2014 by nancyc. Never heard of blue tea, looks really pretty! You’re welcome, Sylvia! The BlueChai site mentions using the tea to color foods like rice, too–that must be a popular thing to do in Thailand! It sounds like a very healthy tea, too! Looks amazing x how are you? Wow! That’s very unusual and creative! I had no idea butterfly pee was blue! This looks super cool, love the vibrancy and colour! Seriously!?! I have never seen blue chai tea. It is so pretty, but almost too pretty to drink 🙂 Stopping by from Inspire Me Monday, I hope you will link up with my two linkies going on right now, Small Victories Sunday and Throwback Thursday. Thanks for sharing! I love tea and am always looking to try something new! This looks awesome! I’ve never heard about this tea… thanks a lot Nancy for sharing this!